This guest post comes from our Juniper Systems Limited team located in Bromsgrove, U.K. Serving EMEA customers, we’re excited to showcase all the work they’re doing in the burial management industry to assist with GIS mapping and data collection. These sites strive to minimise the environmental impact of burial, and plots are often unmarked. While that fosters the mission of a more natural environment, it presents managerial challenges. One such location, Gunton Woodland Burial Park (www.guntonwoodlandburial.co.uk), solved its challenges with the devices of Juniper Systems Limited and mapping solutions of GIS-provider Pear Technology (www.peartechnology.co.uk). Previously an open space, Gunton planted 7,000 British native trees, wildflowers and other flora to form five burial glades, attract wildlife and create tranquil visiting spaces. Currently, visual identification of burial plots is possible. However, once the woodlands and ground cover mature, the task of finding loved ones buried there will become increasingly challenging. 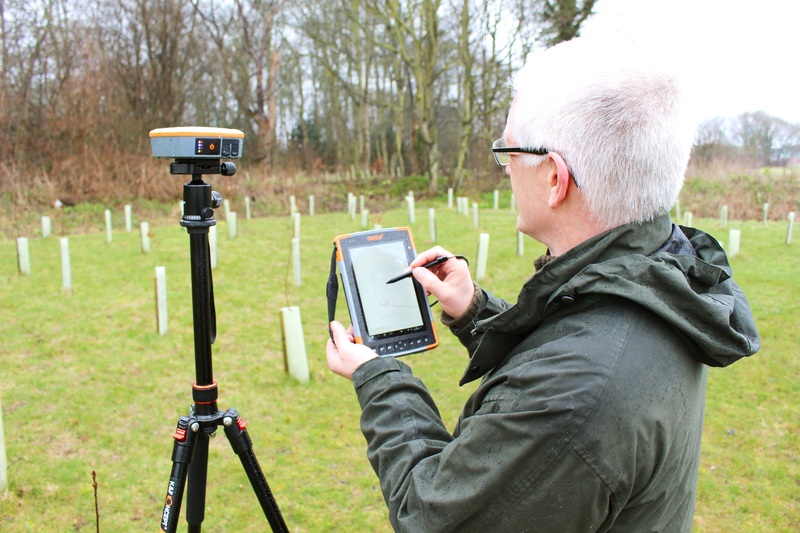 Pear Technology was tasked to survey the area and create an accurate, electronic map of the burial park, allowing park management to locate individual burial plots with confidence, as well as plan future burial plot use. The natural environment and wet weather conditions required rugged, long-lasting mapping and data-gathering devices. Pear Technology turned to the field computing solutions of Juniper Systems Limited, based in Bromsgrove, U.K. Using the Geode™ Real-time Sub-meter GPS/GNSS Receiver, and the Mesa 2™ Rugged Tablet, Pear Technology surveyed and plotted multiple points to create an accurate map of all the park’s features – including significant flora, landmarks, exterior boundaries, and burial plots. The maps were then uploaded to an online burial ground management system, Epitaph. The Geode is a highly-accurate, cost-effective, and self-contained, real-time GNSS sub-meter receiver that can achieve less than 60 cm 2DRMS horizontal accuracy with no external reference data. It is light, offers 10 hours of use on one battery charge, and provides a precise positioning point. Rated IP68, it withstands high variances in temperature and is sealed against ingress by rain or dust. ‘We needed the high accuracy of the Geode to get to below 30 cm of accuracy when we created each point. We can’t ethically or legally disturb buried remains, so it’s extremely important to get it right’, related Mr Jonathan Smith, sales consultant at Pear Technology. Juniper Systems’ Mesa 2 rugged tablet was the ideal companion to the Geode. Also rated IP68 to withstand dust, dirt, sand, and rain, it’s resistant to submersion up to a maximum depth of 1.5 m underwater for up to 30 minutes. The Mesa 2’s ultra-rugged design handles virtually any environment, making it perfect for the U.K.’s weather conditions. Its high-visibility, 7-inch screen also provides superior clarity, as well as capacitive touchscreen ability, and a unique rain profile that allows for continued work, even with water on the display. In addition, the user-swappable, high-capacity battery has the stamina to operate with the screen in use for up to 10 hours. And it offers up to five additional hours of operating time from the optional, internal, ‘hot-swap’ battery. Through two visits, Pear Technology was able to efficiently map several variables on the site, including existing and future plots, as well as ground-water sampling points. ‘That information allowed the creation of a new cemetery map, layout for new plots, and layout for cremated remains plots’, said Mr Andy Cray, U.K. sales manager for Juniper Systems Limited, who joined Pear Technology at the park. In addition to helping sites like Gunton Woodland Burial Park, Pear Technology is also using Juniper Systems’ solutions for other work in the burial management industry, including with traditional cemeteries, and assisting in burial plot re-utilisation. Mr Smith stated, ‘It simply makes sense to use these devices for outdoor mapping projects because the high accuracy level is so achievable’. Feel free to contact us for more information on the products used for this mapping application, or drop a comment below. Barbara Sanner is head of marketing for Juniper Systems Limited, a United Kingdom-based office serving Europe, the Middle East, and Africa.